I decided to put up my little white Christmas tree in my apartment living room this year. I bought it a few years ago at Big Lots. Last year I put up my green tree. I also have a red one. All small table top trees, appropriate for apartment living. I just choose which table top tree I’m going to put up according to whim really. I do usually use a lot of red and white, so that typically remains the same. I adore the combination of red and white. It’s such a fun and spirited combo and it makes me happy to see a tree made up in red and white. The little holiday vignette is beside the TV. Last year I put the tree in the dining room. 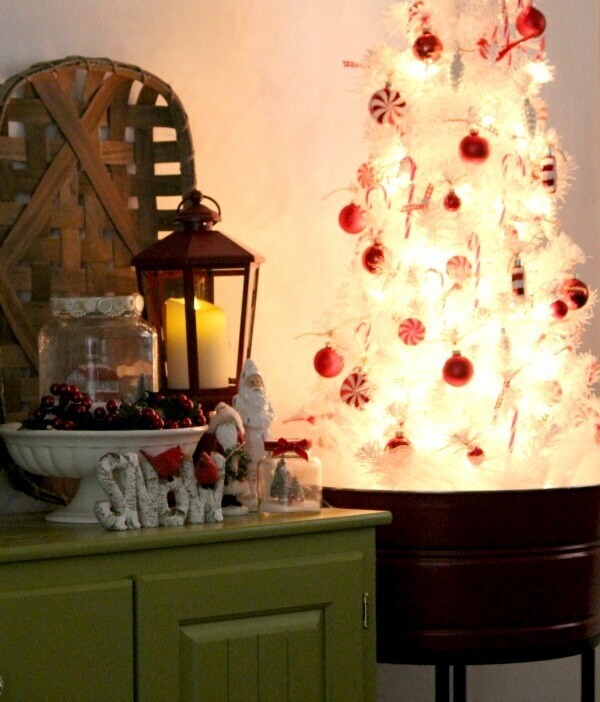 Both times I put the tree in this red galvanized tub I bought a few years ago at the antique mall. It is for beverages, but I use it for my Christmas tree. I’m not putting Christmas all over my apartment. Just in a few select places. Tomorrow I’ll show you my dining table vignette. Maybe I’ll open the front door and take photos with more light. These are pretty dark and also it’s overcast outside. See the “snow” I put around the white tree? That is white netting I use every year to resemble snow. It’s cheap to have some cut at some place like Hobby Lobby. And I think it makes the tree look elegant. Okay, my ankle is killing me and I missed lunch entirely so that’s all I’m doing today. Like I said, I am just decorating in a few areas, because I don’t want holiday clutter on every single surface. I’m getting to the age when I enjoy putting up the holiday decor, but get tired of it rather quickly and then of course I have to take it down. I imagine it’s the same with everyone! Previous Post: « How Do You Distract A Fixated Dog? I love the red tub you have your tree, what a cute idea. I'm with you on not decorating alot. I use to collect Santa Clauses and have a wicker chest full of them and they are staying in the chest this year. Maybe they will come out next year. I love the tree and I think your minimialist attitude is just right for your apartment. Decorating can poop you out so glad you stopped; now rest that ankle of yours! Carol P.S. How is Abi? I could look at that vignette all day! It looks so peaceful and has so many interesting elements that work well together. The white tree with the peppermint ornaments looks so fresh and pretty. That white netting is a great idea. My house is small so I made only a few vignettes this past weekend. I have a small green tabletop tree to still put up. Maybe I will use only red and white as a way to give it a new look. Be sure to rest and eat well. We put our small tree in the top of the dry sink. It's in our den. The 7 ft. Pencil tree is in living room. I have a ceramic tree my aunt made in 1957 on an antique drop leaf table. Surrounded by 3 handblown green glass trees I bought at corning new York many many years ago. Also assorted holy and pointsetia arrangements arrangements around the room. A wreath on my door. That's it! Years ago I would do much more, but we are retired now and this is enough. Stay well Brenda. Rest your ankle. Love to read your posts. Love the tree Brenda, when you said a 'small' tree I expected something different. Your white tree is absolutely gorgeous and I love the idea of the white netting for snow. I love that white tree, it makes me think of a snowy winter's night! It looks gorgeous, Brenda, and I'm sure you're happy to have a little Christmas bling in your cute and cozy home! It's pretty, Brenda. I'm in love with white trees these days. 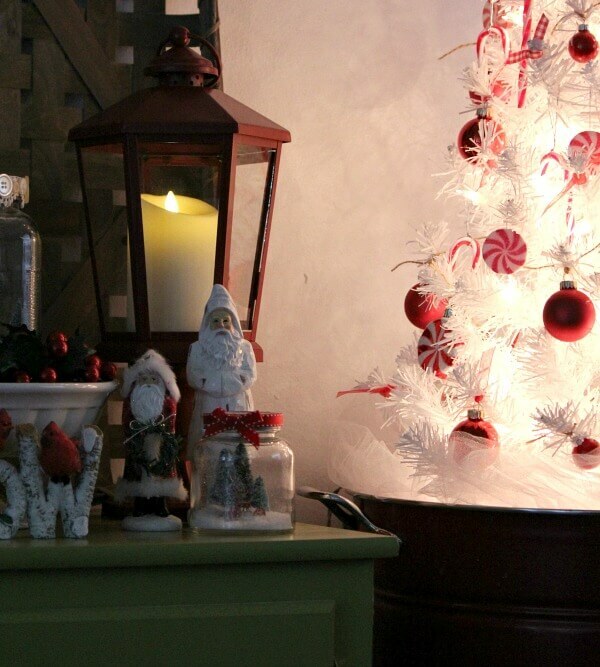 Your tree is gorgeous and the tabletop vignette is great. I love the white. You have given me some great ideas for next year's tree. it looks fresh and simply lovely. 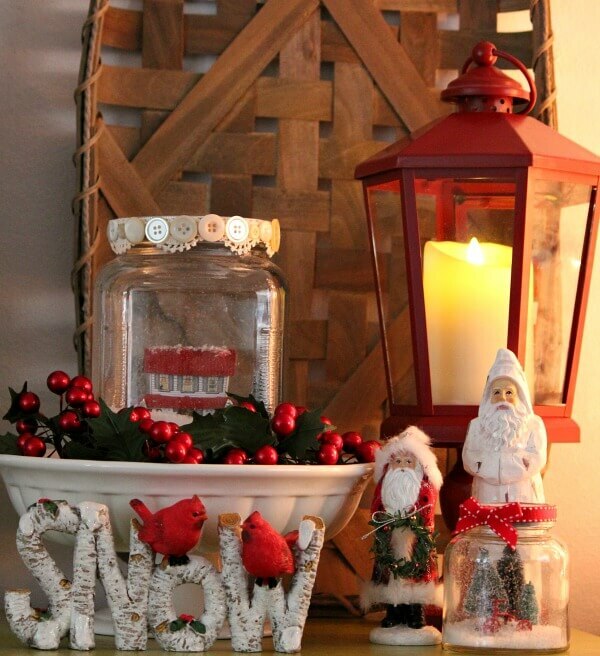 love the wooden basket~weave behind the red and the snowy feel of it all! and tiny white lights… I always love. sorry to hear about your ankle. maybe your pretty holiday tree will make it feel better! What a cute little tree! Love the Christmas touches so far. I love the white tree! Especially in the beverage bucket! Very pretty, Brenda! I love the Santas and how you used the netting for snow! I really love the white tree and the netting is a great idea! I'm behind on decorating this year since I've been sick so much and I'll definitely be scaling back. Until today, the weather has been fairly mild and it hasn't really felt like Christmas will soon be here. I love your cheery white tree, Brenda! And your photos don't look dark to me. It looks like you're enjoying your tree and candle lights in the evening. I am so happy that you decorated! Christmas is " the most wonderful time of the year," for many and a little tree and some decorations make every day a little brighter. At least that is my thought. Your tree is beautiful as are your little vignettes. Enjoy! Beautiful Brenda! I love that white tree. I bought one for my mom's room at the nursing home. It just seemed so cheery, I had to have it! Your little white tree and vignette are beautiful, I love them. Brenda, the white netting is such a good idea, I picked some up to make snow for my little tree. I put it and a primitive looking snowman in an old wood box, then wished for an idea to cover the less attractive parts. This post of yours popped up in my email and I was just tickled by your “snow” idea. Thanks you! I love your white tree with the red & white ornaments. It’s absolutely beautiful! My kids are still fairly young (13 & 10), so we still put up a big tree. But I scaled back in other areas-mainly just decorated my mantle and railing, hung some wreaths, and put out a few of our nativity scenes. I lost my dad earlier this year, so Christmas is hard this season. I also love your vignette, especially the cardinals. They say that they are a sign of a loved one from heaven, so I’ve added a couple of cardinals to our Christmas decorations this year. I’ve read your blog for a while now, but this is the first time I’ve commented. Although we are at different stages in our lives, I really enjoy reading about your life.